Happy Monday friends! 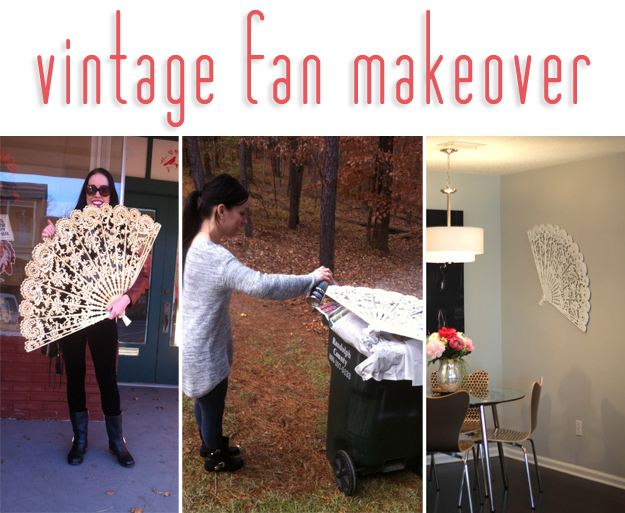 I'm sharing a recent vintage find today - a Burwood brand fan wall decor (I have aways loved fans!) made out of plastic-type material. I spotted this is a small antique/junk shop in the Middle-Of-Nowhere, Georgia, over Thanksgiving break for only $25. Because it was Black Friday and my Mom is a "haggler," I got the fan for only $17! I have a lot of wall space in my condo that needs to be filled and I don't want to choose small 8x10 framed artwork. I need big stuff to fill the scale of the walls so I was very happy to find this for such a great price. I don't spray paint very often, but I thought this piece would be perfect in a gloss white! Two cans of paint later, the original ivory and brown is gone, and a lacquered-look lacy fan hangs on my wall! My Dad helped with the painting and we covered it in about four coats. By the way, these fans are all over Etsy and Ebay and my friend bought one and had it shipped for under $30 total! Not sure on the year, but they seem very '60s or '70s. 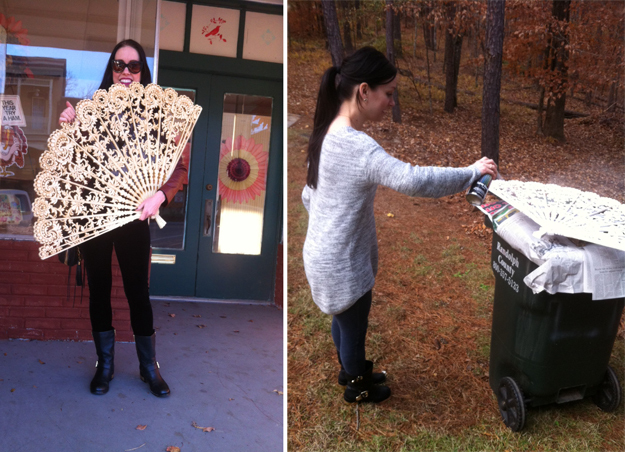 Here is a shot of me carrying it to the car and spray painting the fan! That fan is Gorge and a great find!